Long ago and right this minute. In the cold-blasted streets of Aleppo covered in stone and debris, the trash of a worn-out city where bombs had fallen, bomb on bomb. Families gone, huddled in boats, headed somewhere, anywhere. Hearts breaking like stone. In the bleak mid-winter. Today. Syria is a complicated place to understand. It’s ancient and multi-cultured and there will never be a quick and easy solution. I don’t make any claims to understand it. But I understand the results of the situation. We can all look at the news footage of little children bleeding on the streets and their family crying out for help. Those of us of a certain age remember similar scenes of the children in Vietnam. It happened in Hiroshima, and in most every war before. We can understand why the families want to leave there, to get their children away from the horror of war and to a safe place. To Germany. To France, or Belgium. Or to America. And we know that some of those people fleeing Syria are angry and violent. We know that some of them are terrorists. We’ve seen their work in pictures, too. In France. In Turkey. In too many places. Many of us look at the Syrian children and feel torn between wanting to help them and wanting to make sure our own homes and families are safe from terrorism. And in the mean time, in the very very mean time—the war and the suffering goes on and the children bear the brunt of it. This has been our story all along. We shake our heads and send our prayers and in another generation, in another place, we’ll do the same thing again. 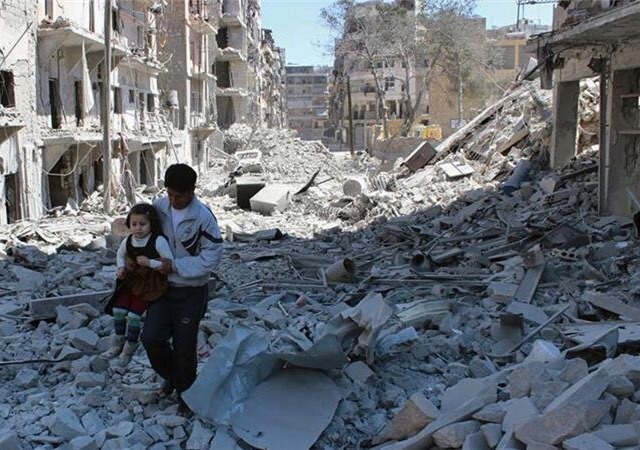 Another Christmas Day will come and go and what city will be next year’s Aleppo? When we see another terror attack in a market, a mall, a church, or an airport? Christ comes to us in the bleak mid-winter, as the poem says. He did that on purpose, of course. 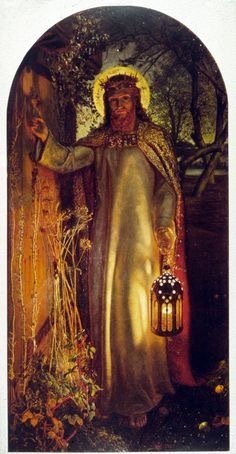 For it’s in that dark and hopeless time that we most need the Light of His coming. We need Him all the more when we can’t find the way, when our own hearts lack all hope and charity. When we don’t see a way to help suffering refugees and at the same time keep our own country safe. We have to find this path. We must. We’ll be held accountable for the suffering that we failed to ease. The New Year lies before us as the refugee camps continue to swell with children, families, and yes, people intent on violent terror against us. As we raise our champagne toasts to 2017, somewhere a child is hungry and alone and somewhere a young man’s hardened heart plots an angry outrage. We are all in the bleak midwinter. One Christmas when I was very small my parents told us that we were going to spend the holiday with our grandparents. This was a new and exciting thing for me. We always spent a few weeks in the summer with them in Texas, but we’d never been there for Christmas. I began to imagine how fun this was going to be! I’d get to see all my Texas aunts and uncles and to play with my cousins. And, of course, spending time with my grandparents was a great treat. Since we rarely got to see them, they completely indulged us with treats and attention. The more I thought about it, the more excited I became about our trip. But, wait a minute. Just hold on a minute here. If I was in Texas instead of Georgia, how would Santa Claus ever find me? How would he know to bring all the toys I’d asked for to my grandparents’ house? More than fifty years later, I fully remember the horror and the panic of that moment. My mother assured me that Santa would find me and that I shouldn’t worry about it. She could usually put any of my fears to rest, but this time, I just wasn’t sure she knew what she was talking about. I kept on worrying about it. I fretted on the car trip out there and for the days leading up to Christmas morning. All the fun I’d anticipated having on this special trip was tainted by that nagging voice in my head: “Will Santa find me? Will he still bring me my toys?” Of course he did find me and he brought me all I’d asked for and more. I’d like to say that I realized Christmas wasn’t about getting toys from Santa, and that I’d ruined the time with my Texas family because of my greedy little heart. But I was only five years old and at the time all I cared about was presents. I’d like to say also that I never again allowed myself to be distracted from the real meaning of Christmas—but that wouldn’t be true either. I found it easy, and even great fun, to be caught up in the materialism of a worldly Christmas. It was too many useless gifts, too many frantic activities, and too much exhaustion at the end of the day. It was only when I’d begun to reclaim Advent in my life that Christmas became more spiritual and much less material. I don’t know why I resisted the Church’s teaching on Advent for so long. I wanted to put the Christmas tree up the day after Thanksgiving and shop until I dropped at every spare moment. I didn’t want to waste a festive minute on prayer or reflection, much less on fasting or charitable works. I wanted to rush right into Christmas and then be completely worn out and a little depressed on December 26. These days, I’ve learned to savor every moment leading up to HIs birth. I re-read favorite devotions and Scripture. I spend time in Advent, rather than just money. And I’ve recognized that Christmas BEGINS on December 25 and lasts those famous “12 Days” until January 6 and the Feast of the Epiphany when we celebrate the coming of the Wise Men. I hope you and your family embrace the season of Advent and, as it draws to a close, that you’re prepared to welcome the Christ Child into your heart. I hope you take the time for prayer and reflection and make the most of moments shared with your family and friends. And remember what my mother told me on that Christmas in Texas: Don’t worry. He’ll always find you. Once upon a time, several years ago, on a cold morning in north Georgia, I was making the short drive from my house to the grocery store. It was the day after Thanksgiving, and once again I was keeping my personal vow to never go Christmas shopping on that day. My plan was to pick up some cookie ingredients and head back home for a day of baking. I was wishing that I’d warmed up the SUV before setting out, though. As I rounded a curve on the small country road leading into town, I saw the flashing lights of a sheriff’s patrol car heading my way. Behind him was the long, slow line of a funeral procession. Here in the South, we pull over to the side of the road when we meet a funeral, so that’s what I did. I remember thinking that Thanksgiving would never again be the same for this grieving family. As my car idled and warmed, I gave thanks for our family’s gathering just the day before and said a quick prayer for the person about to be laid to rest. The hearse passed by me and I prayed the Sign of the Cross. A dozen or so cars came by me before the end of the procession. I was about to shift my car back into “drive” again and go on my way. That’s when it happened. I heard it before I saw it. And when I saw it, I wasn’t sure what I was seeing. For a long few seconds, I couldn’t believe my eyes. The loud “thump” I’d just heard was the sound of a small brown monkey landing on the hood on my car. It looked at me through the windshield with its tiny black eyes, unblinking. I could see the small puffs of its breath in the freezing air. It was wearing a little black collar around its neck. And then, it leapt off my hood and in a couple of bounds, crossed the road and disappeared into the thick cedar grove on the other side. Like it had never happened. HAD it happened? 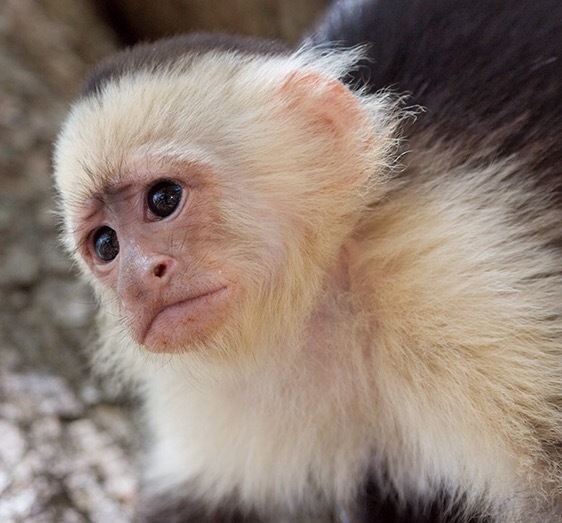 Had a capuchin monkey just looked at me through my windshield on this freezing November morning in north Georgia? Yes, I decided. This had really happened. First the funeral, then the monkey, and then both of them were gone. I looked over to where the monkey had run into the cedar trees, but it was a solid wall of green-black branches. It had to have been a lost pet of course. Surely someone would be looking for it. This happened years before social media, which can be such a big help in reuniting owners and pets. So I went on my way. You’re probably wondering what the heck my monkey story has to do with Advent and Christmas. Well, I can’t imagine a more surprising event than the God of the Universe choosing to be born as a poor baby in a manger. The Incarnation is the most improbable occurrence in the history of the world. An angel appears to a Virgin–surprise! She conceives a Child by the Holy Spirit–surprise! She tells St. Joseph she’s expecting–surprise! He chooses to love and marry her anyway–surprise! Wise men come bearing expensive gifts–surprise! The whole story is one big shocking surprise after another. Our God shocks us with His great love and mercy by His coming to live as one of us, die on the Cross for us, and rise again to save us. And He’ll surprise us when He comes again. Advent is the time to prepare our hearts for His coming at Bethlehem, for meeting Him at the end of our lives, and for His coming again at the end of time. Life happens in the blink of an eye, and its worth should never be forgotten. Before you know it, you’ll be asking, “Did that really happen? Was that real?” Be ready. Be vigilant. Love and forgive with all your heart. Welcome all of God’s surprises with open arms and thankfulness. His hope will always find you. Dark comes early on these December days leading up to Christmas. The cold begins to settle in my bones. When the sun sets the little daytime creatures in the woods retreat to their nests and burrows. In the hours to follow, the liquid dark will fill in every hollow as the frost of almost-winter coats the fallen leaves and the bare branches. The quiet is a different kind of silent night in the woods this time of year. Like the chill of the air, this quiet is a solid thing, with a weight and substance of its own. It’s as if the earth itself is whispering, “Slow down. Wait. Be still.” The world is holding its breath. In a couple of weeks, on the solstice, the earth will begin to journey to the light and warmth once again. 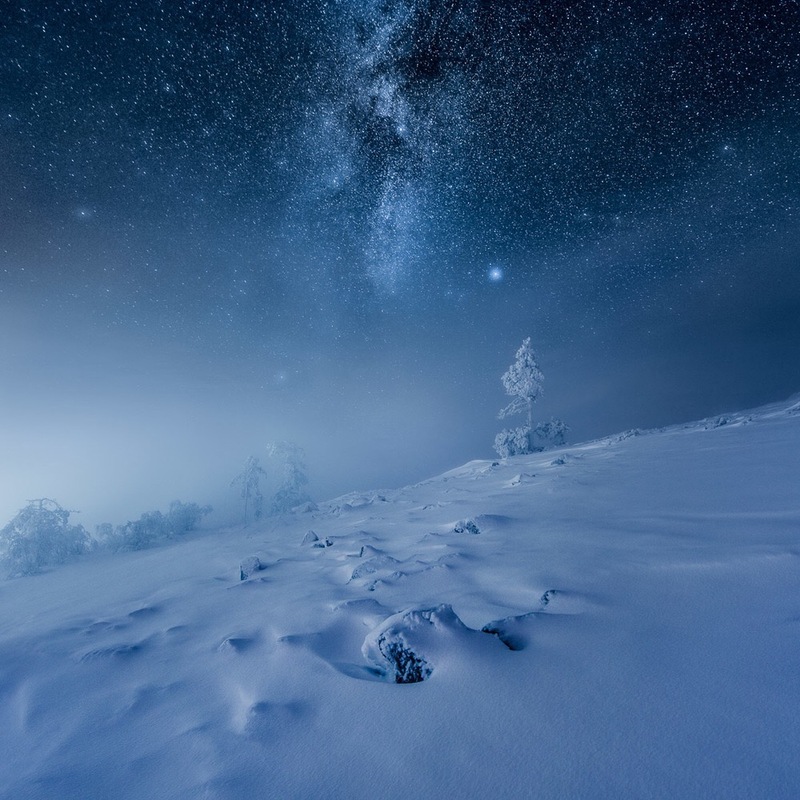 But right now, these are the dark days of waiting and longing in the cold quiet of long and frosty nights. It’s no wonder that the Church celebrates the birth of Jesus in the winter. Life is at its most hidden in the winter. Days are short and the weak light of the sun gives little warmth. We stay bundled inside our own little burrows, hidden and safe. We can imagine, if we try, the Virgin Mary with the Word of God growing quietly inside of her. She moves more slowly now, and with more deliberation. She spends more of her time thinking of her Son and His coming into the world. The darkness of the world is soon to be illumined by His great Light. Everything she does is affected by His presence within her. She waits. She prays. She hopes for His birth as any mother hopes for the coming of their baby. Yet the Virgin also knows Who her Son is and knows as well the road He must travel. The bloom of God within her will one day pierce her immaculate heart. There exists a delicate balance in these Advent days. A balance between light and dark, life and death, action and reflection. Above all, it is a time of learning to be patient. We wait to hear His voice. We stop focusing on the busyness of the world to reflect on eternal things. We prepare the manger of our hearts to receive our Savior. We put aside our wants so that we can meet the needs of the poor, the sick, the imprisoned, the outsiders in our community. Every Advent is another opportunity to be light in the darkness. We waste this time of patient preparation if we allow ourselves to be caught up in the world’s push to purchase and display and out-do. We can’t be merciful if we’re in a competition. Mercy thrives in humility and service. And patience. In the cold dark nights of winter, a great Light is coming. Our waiting is a gift to the Light. As we learn to conform our will to His will, we love more, we forgive more. We know that love is kind, but it is, first of all, patient (I Corinthians 13:7). We wait. We prepare through our repentance and our almsgiving. We share our abundance with those who have less. Patient love endures in hard times. It grows in the heart that turns to the Light despite the coldness of a world that despises her King. Winter roots hold life and the promise of the coming spring. In the dark and cold, they grow strong and sturdy. And when the Light returns, they’re ready. They send forth new life. This is our calling—to prepare ourselves for the Light that is coming. Alleluia.